BordO2 La Baronne VG E-Liquid - Money Off! Just like a baroness, the BordO2 La Baronne VG E-Liquid is a combination of sophistication and luxury, layering several flavours to make an indulgent blend that is a treat for your taste buds. Combing biscuits, cupcakes, strawberries and cream, this e-juice is packed with flavour for your enjoyment. BordO2 are a French company who certainly don't do things by halves, employing food and wine connoisseurs to ensure the ultimate flavour in each batch. La Baronne VG E-Juice is available in a pack of two 10ml bottles with a nicotine strength of 3mg. A child-proof applicator is supplied with each bottle. Some of our stock of the La Baronne VG E-Liquid is nearing its expiry date and, in light of this fact, we are offering the affected stock for a discounted price of £4.50. Act quickly, as this offer is only available while stocks last! La Baronne is indulgence in a bottle. Ladyfinger biscuits with an inch thick cupcake balanced on top are finished off with a fresh blend of strawberries and cream, adding freshness and sweetness alike to this sensational blend of flavours. La Baronne VG has a combination of 80/20 (VG/PG) for a smooth vaping experience. 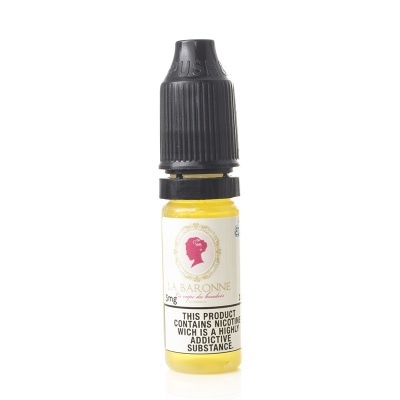 The La Baronne VG is supplied in a pack of two 10ml bottles only for your enjoyment. The BordO2 La Baronne VG E-Juice is available with a 3mg nicotine strength only.